Nashoba FC is dedicated to the holistic development of soccer players, an approach that goes beyond soccer skills, and includes the physical, mental and emotional aspects of working towards both the success and failure of one’s efforts, the rewards and sometimes humbling experiences that result, and the friendships that are developed along this continuum. Everyone involved in our program, from our parents, players, and coaches to our program administrators – we all want to win – after all, the objective and fun of most games is to win and this basic principle of any sport/game cannot be ignored. Players and parents must also recognize that there is a distinct difference between recreational and competitive soccer. Nashoba FC is a competitive soccer program, players (and their parents) wishing to join an Nashoba FC team must already embrace this, or they must learn to embrace this distinction. Thus, one of our objectives must be to help players understand “what it takes” to compete beyond recreational soccer. Having all of the fundamental skills of soccer won’t allow a player to succeed in a competitive soccer environment if they are not willing to add to those fundamentals a superior set of the associated intrinsic skills that are also at the core of the game (effort, aggressiveness, toughness (mental and physical), tactical awareness, etc. Soccer is a contact sport, that, when played by a complete player exhibits all of these characteristics and more. This composite suite of attributes to play the game well make it the outstanding / beautiful game that it is – the most played game in the world! The desire to win cannot be replaced by a subset of these attributes; it must entail ALL of them. The objective of the game is to have fun – but fun within the context of playing at a very competitive level of soccer, which requires all of the skills of the game, and all of the intrinsic qualities of a soccer player to have fun at that level of play. The Nashoba FC development philosophy therefore recognizes winning as a mental and physical characteristic, which we must nurture and support in our players – winning is not valued in the context of team or club records. The Nashoba FC development philosophy also strikes a balance between two competing forces that must be acknowledged – 1) that players (and often their parents) want to win now, and 2) that to win and succeed later in a player’s career, a player’s development must progress through stages. This must be addressed by ensuring that winning games does not come at the expense of a player’s development. From a development perspective, winning must be accomplished through good training, teamwork and intensity. A misdirected focus on winning results in poorly played soccer – a style of play and a tendency by coaches to exploit the raw physical abilities of early bloomers at the expense of their fundamental development needs in the pursuit of club or team statistics. This approach will result in the failure of players by 1) failing to provide sufficient training in the fundamentals of soccer for the physically advanced player who is rushed through the system and often placed on competitive teams beyond their capabilities, and 2) by failing to provide the smaller but possibly more fundamentally advanced player with advanced training and the right soccer environment to succeed later when their size and physical capabilities mature. This is not the Nashoba FC philosophy. 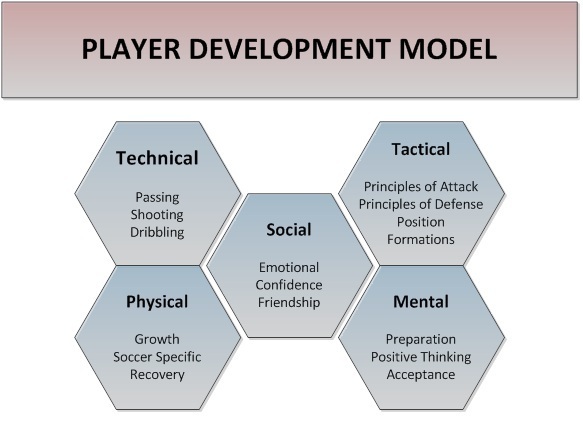 The Nashoba FC philosophy places development over winning and ensures that all players learn the fundamentals that are so critical later in a player’s career, and also ensures that a player’s development plan is scaled to each player’s long term development needs, which may evolve differently as each player matures both physically and mentally. In short, the Nashoba FC player development philosophy includes the development of the complete player – which includes their level of intensity and willingness to truly play a contact sport and be willing to except the physical demands of the game, as well as the development of the fundamental skills required to execute in the game. No parent, administrator, or teacher would expect students to be performing college level academics in elementary school – but rather the student must master the building blocks of the more complex academic concepts before advancing. At the same time, as teachers we are always trying to instill in our youth students the desire to excel through intensive study and dedication to learning – to establishing goals and achieving them. The Nashoba FC process and approach to developing soccer players is no different. A player who is kept in goal, because they are the best keeper, and we have to win. Conversely, the Nashoba FC philosophy recognizes that the modern keeper also needs to function as a player and lead the defense. They’re a field player. They don’t just stand between the sticks. So if that’s all a keeper is doing, they’re development is being delayed. A player sits the entire game, or only gets to play meaningless minutes because the team must win. For Nashoba FC, players come to play, they don’t come to sit. Players want to play, they have the right to play and in order to reach their potential, they must play. A player is discouraged from advancing to more competitive teams because we need them to win games. For Nashoba FC, each player needs to be able to rise as far as their ability takes them, even if they leave the club. It hurts when a player leaves for a higher level of play, but, in the meantime we need to remember that they are Nashoba Regional School kids who could potentially be playing for Nashoba Regional High School in a few years or better yet, at the collegiate level. We must never discourage player development to satisfy a team need. Our job is to develop players, and any system, tactic or team is only as good as the individual players within it. Our coaches must ignore the impulse to move players to satisfy a team record in lieu of satisfying the club’s mission to develop the complete player. This principle speaks directly to the Nashoba FC approach to team formation – we will place players on teams that give them the best opportunity to develop over the formation of teams that are designed simply to win games, and we’ll ensure that those teams are placed in leagues that best match their competitive needs to progress and be successful. Nashoba FC’s philosophy is to promote training activities that recognize that kids play for fun (and hopefully we instill in our players the desire to continue to play as adults). Small-sided games that scale down the adult game to an appropriate size will maximize touches for the individual player, make it easier to interpret situations requiring player decision-making, and keep the game simple and fun. Imposing the 11v11 adult game on youth players too early will frustrate and impede their development. The Development Stages table within this document outlines the focus of each age group and player characteristics that must be taken into account when developing the activities used to train our players. Or rather, watching the High School program continue to thrive because the Club is advancing players who are ready, or welcoming back an alumni player who is coming back to coach in our club? Or even watching a Nashoba FC player reach the highest levels of the game? What is your trophy as a parent – you play an important role in the organization’s player development philosophy via your support and encouragement of each player? When we are developing and promoting excellent players, players who continue to pursue the game competitively, for the pure enjoyment the game has to offer, to coach youth, or to continue to enjoy the friendships of those with whom they played while with Nashoba FC - that’s our reward!